An official picture of Prince George has been released to mark his second birthday. 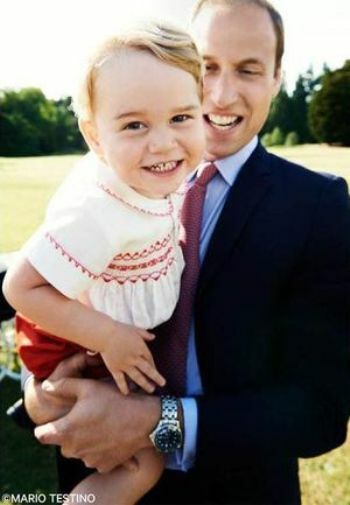 The picture, taken by fashion photographer Mario Testino, shows the toddler smiling in the arms of his father Prince William. George’s birthday is on Wednesday 22 July and the Duke and Duchess of Cambridge are likely to have a party for their son at their Norfolk home. The picture was taken after Princess Charlotte’s christening on 5 July. It was taken in the gardens at Sandringham House, on the Queen’s Norfolk estate, and was part of the series of official photographs taken following the princess’s christening. “This photograph captures a very happy moment on what was a special day for the duke and duchess and their family,” a Kensington Palace spokeswoman said: . It is thought the duke and duchess will celebrate George’s birthday privately at Anmer Hall, their Norfolk home, as William is still settling into his new job as an East Anglian Air Ambulance helicopter pilot.